I'll be attending the Conference On the Idea of Communism at Birkbeck later this month. Rather giddy about it; doing some pre-there reading to synch myself up. University is, as it consistently has been, underwhelming. Very often I think of it as a monetary fee I agreed to in order to somehow meet my partner, who was introduced to me by a University friend. This introduction is worth the debt; as is the random, unrelated situations which come from being in this location rather than this institution. IHTFP. Why are people bothering me about the images & interpretations of the Rorschach test cards? I believe the term I should use in replying is 'get bent'. This video makes me gay (for my partner). Does watching it change your ability to be psychologically evaluated? Please complain like a wimpazoid in the comments. Finding patterns out of nothing is not solely basted on some deep inner psychological flaw, but rather in response to every other image we've experienced within our lives in the formation of our personality. We've already seen all this ink. Gorse is my favourite flower of the moment. 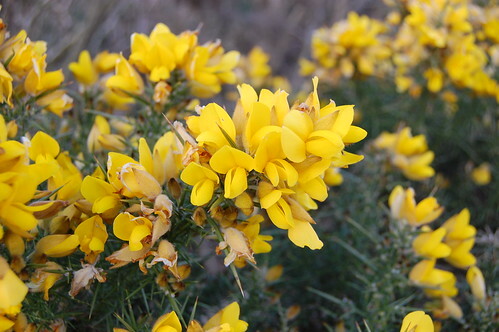 I have a single gorse bud, pressed and dried, which was exchanged between my love and I on boxing day 2008. Being as I am poor at expressing my sentimentality, I keep it hidden secretly in my notebook; yellow, like the little paper frame I made to keep Ese-E's photograph in over my desk. Gorse also smells of coconuts/vanilla. How awesome is that?